Punjab National Bank Account holders now can enroll for PMSBY and PMJJBY in Punjab National Bank via SMS. 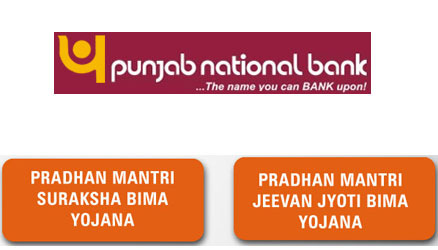 Below is the process how to enroll for PMSBY and PMJJBY in Punjab National Bank through SMS. To Register for Pradhan Mantri Suraksha Bima Yojana (PMSBY) Rs.2 lac Accident Cover for an annual premium of Rs.12 in Punjab National Bank (PNB). Send SMS PMSBY <last 4 digits of SB A/C No.> <Nominee Age> <Nominee Name> to 5607040 from registered mobile, Premium amount will be debited from your PNB Savings Bank A/C every year. To Register for Pradhan Mantri Jeevan Jyoti Bima Yojana (PMJJBY) Rs.2 lac Life Cover for an annual premium of Rs.330/- in Punjab National Bank (PNB). Send SMS PMJJBY <last 4 digits of SB A/C No.> <Nominee Age> <Nominee Name> to 5607040 from registered mobile, Premium amount will be debited from your PNB Savings Bank A/C every year. Wt is SB A/C NO.?????? Wt is SB?? SB A/C No. means your Savings Bank Account Number. your savings bank account ur nominee’s bank account no… since u sms from registered phone no., they know ur account no. too via ur mobile no. so it sounds illogical that it would be urs own account no. Your point is correct but its the SMS format provided by PNB Bank to enroll for PMSBY and PMJJBY. Make sure you have sent the SMS from registered mobile number as well as check if you have kept space in between the SMS format. Make sure you have sent the SMS from registered mobile number. invalid incoming ?Now How can i enroll ? Please confirm if you have sent the message from your registered mobile number as well as check if you have typed the keywords correctly. If still problem arises please contact PNB Customer Care department on 1800 180 2222. Alternatively you can even Register for PMSBY or PMJJBY in PNB Bank by visiting the branch. Please try again to send SMS from registered mobile number. According to your age if you want you can subscribe for both plans. Can anyone get benefits of both policy simaltaneously at same time. If someone have both policy active died of accident then he gets 4 lacs rs or 2 lacs. Yes you can apply for both policies if you meet the eligibility conditions, and secondly if a individual who have applied for both policies dies with an accident when the policy is active he will get both 2 lacs + 2 lacs = 4 lacs coverage. And what about 1 lac policy of jan- dhan account. wo bhi alag se milega ya wo nahi milega. There might be some temporary network problem, please try sending message later. Contact your branch to issue a hard copy of Insurance Certificate. How to get the certificate or acknowledge receipt of PMJJBY of PNB….? Just get in contact with your bank. Rs 330 is debited from my account due To PM JEEVAN JYOTI YOJANA Insurance plan. Now I am asking that how certificate can be downloaded? How Jeevan Jyoti Yojana certificate can be receieved? how to download PMSBY and PMJJBY certificates on PNB??????? ?